Apple's senior vice president of worldwide marketing Phil Schiller in the Steve Jobs Theater on the new Apple campus last night. TECH COMPANY APPLE has released the details of its new smartphone, the iPhone X – which is pronounced as ‘ten’, not ‘x’ by the way, to commemorate ten years since the first iPhone’s release. Among the new phone’s features are face recognition software that’s used to unlock the phone, improved cameras and durable glass, according to Apple. But it’s not the tech features that caught our eye – it’s the price of the new gadget. 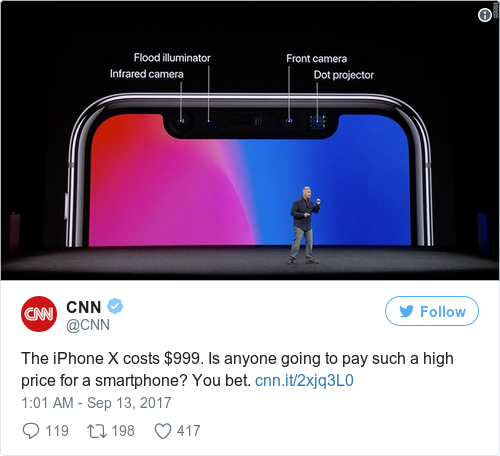 Apple has already raised the price since its last model, the iPhone 7, from $815 to $999, which is its pre-tax price (and equivalent to €833.99). But the price of buying the phone in Ireland isn’t €833.99. It will cost €1,179, almost a third more expensive than buying it in the US. Even after taxes are added to the US price, it’s still a stark price difference. The bump isn’t unique to Ireland: iPhone prices vary around the world. In Canada, the new phone is almost $100 (€83.50) more expensive than in the US. In France, Germany, Russia, and New Zealand, it’s around $300 more expensive (again, this is compared to its pre-tax US price). It’s not the first time that iPhone prices have shown such discrepancies. Business Insider previously compiled a list of the price of iPhones around the world and compared it to the US price. There are a number of reasons cited for the gap in costs: one of which is currency fluctuations. But that doesn’t explain why there are such differences within EU member states, which share the euro. But Apple Inc also has a history of charging more for their products in countries that have a high average income, disposable income, or other factors based on market research. Although Jan Dawson of Jackdaw Research called the iPhone X “a far bigger upgrade” than previous devices, he questioned whether Apple was stretching its market too thin. Other tech experts and commentators say that iPhone fans are very loyal and unlikely to switch devices, so the company can afford to stretch its prices. 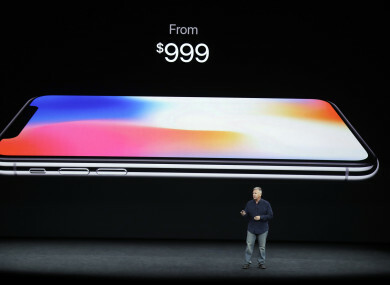 The unveiling of three new Apple products last night comes as the company seeks to recapture the success of its first iPhone release in 2007 as it struggles to maintain its market share. - With reporting from AFP and Business Insider. Email “Why will the new iPhone cost more in Ireland than in the US?”. Feedback on “Why will the new iPhone cost more in Ireland than in the US?”.